What are the strongest arguments against Evolution? Dr. Reagan: I love that question because it just opens up every area of Science. 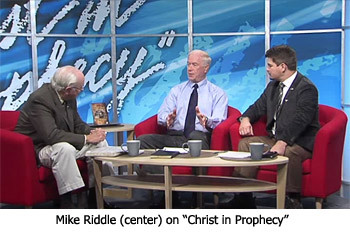 Mike Riddle: To start off with, a lot of people say that the battle is between God's Word the Bible and Science. No, it is not. Because, who created all the scientific principles? God did. He is not in a battle with Himself. So, true Science will always support God's Word and refute Evolutionism. Let's get to some of the favorite arguments I use. The first one is called the "Origin of the Universe." Where did the matter come from to create the universe? We all know from good science and logic that from nothing, nothing comes. That question right there is a killer to the evolutionary model, because if you can't even get the first piece of matter then you've got nothing. Mike Riddle: Here is one of my other favorite argument I call the "Origin of Life." I love this one. Why? Let's just take the cell. Let's start with one cell, for we've got about 60 trillion of these in our bodies. The cell is more complex than any machine mankind has ever made. Sixty trillion. Did you know that is greater than the national debt right now? Nathan Jones: Not for long! Mike Riddle: Well, yes. We have 60 trillion cells and each cell is more complex than any machine mankind has ever made. But, we don't have to talk about a cell. Let's go further back in complexity and just talk about one single protein, not DNA, but just a single protein. Our best scientists in the world cannot produce one single protein. They come up with all these explanations for why they cannot. Mike Riddle: Here's the point — life cannot start in the presence of oxygen in the atmosphere because oxygen destroys chemical bonds. So, if there was oxygen in the atmosphere, life could never have begun. So, what Evolutionists teach in our schools is this: the atmosphere was different back then and there was no oxygen. That is a ridiculous thought, too, because if we take away all the oxygen we have no ozone, because ozone is made out of oxygen. If we don't have any ozone then those ultraviolet rays come down and fry all life, therefore everything is dead. Now what Evolutionists are saying is that life started way down deep in the oceans so the sun light could not reach the proteins. I first think, "Wow, what a wonderful idea!" But, there is a process of water called hydrolysis, with hydro meaning "water." Hydrolysis literally means "water splitting." Water is necessary for us to survive, but it is one of the worst places in the universe for life to begin. Life cannot start with or without oxygen, and it cannot start in water. That is a huge problem for the Evolutionary model. Mike Riddle: Let's then look at the structure of a protein. We have hands, both left and right. Our left and right hands are made up of the same things — four fingers and a thumb. But, the hands are not quite the same, because you put one hand behind the other and you'll notice your thumb and fingers are on opposite sides. Amino acids, which are these things that make up our proteins, they also come in two shapes called left and right-handed. They are mirror images of each other, just like our hands. Here's the situation. Every amino acid in all biological proteins and in all life is left-handed. The natural tendency when we let bonding go along by itself always bonds left and right. Our best scientists in the world in every experiment they've ever done always ends up with left and right-handed amino acids. The result is like death, for such a configuration poisons life. Life requires 100% left-handed amino acids. There's a lot to point out right there from a scripture — Romans 1:19-20, "God has given us all the evidence we need for believing in a Creator and no one has an excuse." I believe protein bonding is one of the great examples right there. Life cannot start by naturalistic processes. I think that is a powerful, powerful tool for people to use in countering the Evolutionist's false claims. Dr. Reagan: I'm surprised you didn't mention the argument that most people use, and that is the argument of design. Mike Riddle: Design, well cell complexity and protein bonding both come under design. We could go on for days and days on just design. Dr. Reagan: All my life I wanted to see Mt. Rushmore. All of my life! Finally on our 50th wedding anniversary, my wife and I went to South Dakota and I finally saw Mt. Rushmore. I just stood there and thought, "Isn't it amazing what can be accomplished accidentally by erosion?" No, in truth, it hits you — when you have something that is designed, you have to have a designer. Mike Riddle: Right, when you look at every creature, every animal, you see incredible design in there that defies Evolutionism. Dr. Reagan: If I were to say that Mt. Rushmore was created accidently by erosion, a scientist would say I was insane. And yet, he turns around and says the whole universe accidently happened! Mike Riddle: Right. Take a look at our computers, well we know they didn't happen by accident, and they are nothing compared to the human body. Dr. Reagan: There has to be a designer. Nathan Jones: Romans 1:20 says that, "For His invisible attributes, that is His eternal power and divine nature, have been clearly seen since the creation of the world, being understood through what has been made, as a result people are without excuse." We have no excuse for denying a Creator. Dr. Reagan: At the time that Darwin wrote his book, he wrote about the complexity of the human eye. That was before they even had good studies in microbiology and all of the discoveries that we have now. He was just sure that Science would ultimately prove Evolution. And yet, it seems the more Science we discover, the more evidence we have against Evolution. Mike Riddle: Right. Actually, the best evidence against Evolution is God's Word itself, because it has never changed. There is a lot of Science in the Bible, and it has never had to change. But, our Science textbooks, we have to keep updating them, don't we? Dr. Reagan: When you talk about a lot of Science in the Bible, that is so true. For example, the Bible talks about how the earth is round (Job 26:10; Proverbs 8:27; Isaiah 40:21-22). And yet, Evolutionists call us "flat-earth people" if we believe in the Creation. Mike Riddle: Here's another argument — morality. What's the difference between good and evil? How do you determine if something is good or something is evil? When asking the Evolutionists that, they really don't have an answer. They cannot give a universal definition of what is evil and what it good. They'll talk about how maybe it's one's own opinion. Well, everybody has different opinions. Or, they'll say morality is whatever society believes. Well, different societies have different values. Only the Bible gives a universal definition. God commands us to be perfect. But, do you know what, we're not perfect, are we? God gave us a solution on how to be perfect, and that's His Son, Jesus Christ. So, God gives us the definition for He is the One who declares what is good and what is evil. He also declares that we have to be perfect, and He provides the solution for becoming perfect — accepting Jesus Christ as the Son of God and Savior of our souls. In the seventh segment of this Creation training series with Mike Riddle, he'll explain why DNA destroys the Evolutionary model. I have spoken to others who don't believe in evolution but do believe in something they call 'micro-evolution' it was explained to me as ways we have changed thru the ages. One example was taller or no use of certain teeth. I think of that as adaption that was built in to our created design. But they say it is micro-evolution. Would like any thoughts. I believe in straight up creation. But would like more input if I have misunderstood. I disagree. I do not accept the statement "...who created all the scientific principles? God did." Scientific principles are a creation of the infinitely limited knowledge of man. Now, we may be able to apply some of our laughable scientific knowledge to try to prove the Bible to be true and may succeed. But to do so is an error. To say "...life cannot start in the presence of oxygen in the atmosphere because oxygen destroys chemical bonds." is ridiculous. For the Bible says with God ALL things ARE possible. If God wanted to do it, HE COULD! That is why I personally am against trying to use OUR scientific knowledge to prove God and the Bible to be true. It is NOT NECESSARY. Belief in the Word of God only takes FAITH ALONE. Trying to use MAN'S "science" is a waste of time and effort. The Bible says we can't possibly imagine what God has in store for us in our eternal perfected life. This proves to me we are incapable of ever having any knowledge that will ever come close to the knowledge of God. That is one way satan got it wrong. he thought he could knew just as much as God and could actually take over. Man thinking he actually is intelligent to the point of being able to scientifically explain the ways of God is the ultimate in arrogance. 1. I am NOT attempting to attack the L&L guest, Mr. Riddle. I am commenting on the basic issue of "defending or proving the Bible and God" via science and/or melding the two. 2. I do not believe in evolution. I believe in the six 24 hour creation. ...I can not trust in science to prove the Word of God, I can only trust in faith alone to believe in Word of God. Sometimes I don't communicate things very well so apologies for any misunderstandings due to my lack of clarity. Life didn't start in the presence of Oxygen. Oxygen came later after chlorophyll. Jeri, macroevolution is the unobserved and unproven idea that one creature turns into another creature. What is observable and provable is microevolution, that species can vary their appearances within the species. For instance, dogs through the generations have been bred to make everything from the mastiffs to a Chihuahuas, but they've always been dogs and always will be. Humans, too, over time follow different family genetics which when separated at the Tower of Babel began breeding racial distinctions. It WILL happen, you WILL acknowlege Jesus as Lord. For the sake of your souls, I pray you confess this before the day of judgement. Earth's early atmosphere had abundant oxygen. Life uses only left-handed amino acids. Evolution is the foundation of an immoral worldview. John, according to your eye link, at a "1 percent change, the evolution of the eye would take 1,829 steps, which could happen in 364,000 generations." So, by that reasoning, if I leave some silicon on the table, it'll over hundreds of thousands of generations all on its own become a supercomputer? Takes a tremendous amount of faith to believe in Evolution. I look at design, I see a Designer. Little faith involved there. Who is the more religious person then, the Evolutionist or the Creationist? Based on the amount of faith involved, it's a pretty obvious answer. If things without eyes could evolve into things with eyes, then it follows that some silicon can evolve into a supercomputer. It is uncontroversial that bits of silicon (and supercomputers for that matter) are not living things. The evolutionist seems to claim that only living things are subject to the mutations required for the evolution of biological phenomena such as eyes. Or are silicon and living things similar in some other important way that allows this analogy to be more informative? It requires more faith to believe in evolution than it does to believe creationism/intelligent design. If one explanation is less obvious than another (contrary) explanation, then is the less obvious explanation necessarily false? Likewise, are only the most obvious explanations necessarily true? An argument from incredulity alone seems to require both answers be 'yes'. Furthermore, isn't an explanation's obviousness a rather subjective experience? Analogously, any number of optical illusions may provide one with a phenomenon that appears more obviously to be what it is not. Yet to another subject, perhaps one more familiar with the phenomenon, may not make the same perceptual mistake.